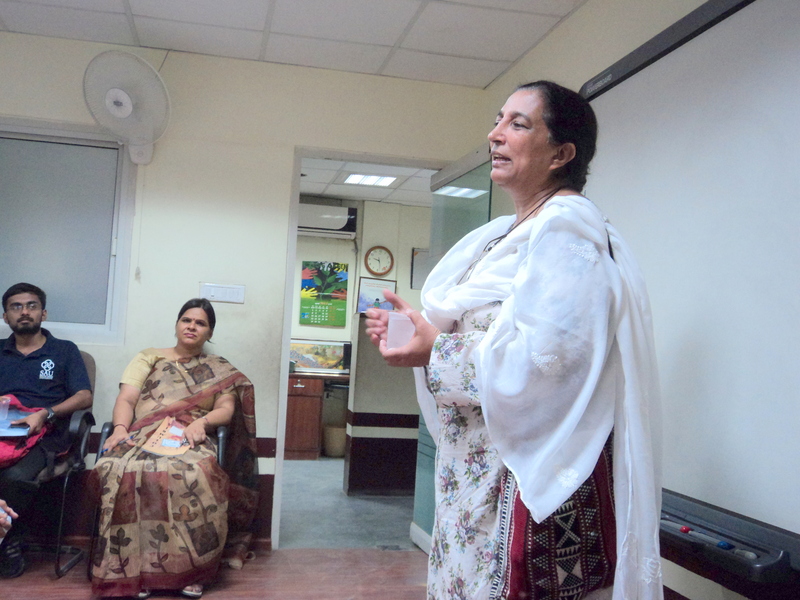 “Do Hindus live in Pakistan?”, asked a young girl to Ms. Saeeda Diep, a Peace activist from Pakistan. With a smile, she replied, “Yes, my dear. Hindus, Sikhs, Christians and people of many other religious faiths live in Pakistan”. These were some of the many questions that students of a school in Delhi had asked the peace activist during an interactive session called Aman Chaupal, an initiative of Aaghaz-e-Dosti aimed towards Indo-Pak friendship. It was a small room with about 50 students heavily-equipped with questions and a lady with a serene and smiling face. She answered all the questions with an unchanging expression of calmness and with a warm smile. This was because she was on a mission. She was out to face the weapon of miscommunication. “We have about 20 Indian channels but you people do not have a single channel so you know nothing about Pakistan. We have not been able to present ourselves to you.” So after each question, she would say, “please ask more questions”. Having some level of communication with people from Pakistan, I could not help laughing when the politically-charged questions didn’t stop. But I was not surprised at those questions. Infact, I, like Saeeda ji, was happy that they asked these questions because then they won’t think that we were there to “pacify” or “convince” them. Yet, I must admit that I was surprised to see that she had a calm and beaming face throughout the session. Her words as well as those questions have stayed with me. She had emphasised on the lack of communication and the hawkish media that our Indian democracy has granted us. I would completely agree with her on this. The media is the fourth pillar of democracy yet in our country, it is not independent and is biased. It carries the burden of invoking nationalist fervor and in doing so, it often ends up with arousing jingoistic sentiments. The media was at its worst best during the case of Sarabjit Singh when Sarabjit was made a “national martyr” and the attack on Sanaullah Ranjay was seen as a “reaction”. The same can be said for the border clash of January. There was no reporting at that time. The news channels were busy running documentaries. I often find it a little surprising that the media which is desperate to do something ‘innovative” does not ever attempt to consult the “other” side. There is a clear divide between what the major newspapers of both the sides report. Yet, no attempt is made by either sides to come up with a neutral source. No-one ever gets to know the “truth” and actually, it seems that no side is even interested to know. Why? There are reasons and the reasons are political. This is a weapon and a far lethal one. The military clashes are short-lived. There is a ceasefire but this weapon is not short-lived. It is a slower process but much more effective. It allows for the proliferation of hatred to people beyond the direct sufferers. 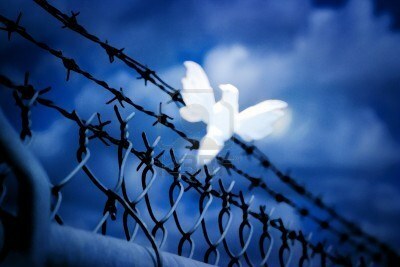 It is effective enough to make peace, a fantasy of the “liberal”. A resource for many, it helps to create an unchallenged “need” for war, for hatred. The war mandate rests on the unchallenged assumption that the “other” hates us. Thus, it is an important raw material for what Saeeda ji had said, a “war industry”. This also explains why there are attempts to disrupt any efforts to enhance people-to-people communication between the countries. Miscommunication is essential for hatred and suspicion. It was a happy day for some of us who had gone to kotla stadium on the last match of the T20 series between India and Pakistan with our face painted in flag colours of both countries, displaying poster and distributing pamphlets with messages of peace and friendship to the cricket fans of both countries. We were moved by the appreciation that we got, especially from people from Pakistan. Some of them had themselves came to us, introduced and asked for the pamphlet. Our event, under the initiative of Aaghaz-e-Dosti, turned out to be a huge success even on social networking sites and was picked up by some major news portals. It was deeply satisfying and paid off our labour as we thought that we have started on our journey to move for a better future together. But two or three days later, the media reported the border clash but initially, I had not imagined how it would change things overnight. The social networking sites became another battlefield. Status messages and comment thread, the “shared photo culture” developed by Facebook pages and new pages devoted to questioning peace initiatives, digging old graves, debating if India is a “soft” state or if India always stabs Pakistan(by the Pakistan side) and poems dedicated to soldiers and the army. It was and is all over – on the news channels ofcourse, endless news debates but almost all debating if we should continue the ties or not, on Facebook posts, in Facebook pages and ofcourse in the tea-time discussions. Following the clash, there have also been innumerable articles challenging and finding the loopholes in all the claims starting from the report of beheading to the role of a third party to manipulate the politics in its own favour. But the question no longer is about who started it and did it involve beheading or not because the damage has already been done. What has sadly come out of this is the notion that it’s only “we” who want peace and that “they” have always stabbed “us”. This notion exists on both sides of the border. And this notion is enough to persist another decade of hatred and suspicion. People on both sides have sided with the army that have otherwise, accounted for human rights’ violations and with the politicians whom we refuse to accept as our representatives. They refuse to see any “anti-nation” sentiment. And once again, the “nation” as an identity has become important surpassing the individual and the individual opinion and desire. The peace activists or anyone with a voice of dissent are once again seen as not only “anti-nation” but as passive, ideal and those who have not seen the “reality”. This article is not to pacify anyone or to convince. It is only to bring out some “realities” which cannot be challenged. This is based on my own personal observations and on the articles that I have come across. If I talk about the articles, I have read many articles which have brought out the loopholes in the theories put forward by both the countries. There have been questioning of the hazy and inconsistent reporting by the army on both sides, loopholes in the reports and questions for media to have covered issues which have shown India or Pakistan only in a bad light. This brings us to one fact that the truth is partial. None of us can claim to know the truth. There is a need to establish a neutral news source accepted by both countries. For those who feel that peace is only the desire of one side is mistaken. To begin with, if this was true, Aman ki Asha would not have received equal appreciation on the other side of the border. Coming to my personal observations, I have been following the posts and tweets of people of across the border (Pakistan) and have some interesting revelations. It is true that some of them, like some of us, have tagged peace initiatives as bogus and indulge in a sort-of “godification” of army generals and soldiers. But it is also true that many have also condemned this incident. I have some friends there and there has been no change in the nature of our interaction. I also came across a facebook post today by someone asking if peace should be continued with India? I found the very status very interesting as the same question is posed by most of us as in this status, there is an assumption that “we” are peaceful. Most of the comments favoured yes. There was a comment that said that we should, if they also do the same. Those who said no had also added reasons stating how India has often stabbed back or because they do not want peace. It was essential to give this “private” post as it reveals some facts and demands an action. We and here I mean the people or anyone who likes to have an opinion should be critical of our own Government, media and army. On both sides, we need to accept that there are people who do not want peace, for their own motives. But more importantly, we need to accept that humanity is beyond boundaries. On both sides, there are humans and human lives. Those who want war or can even think of it should imagine what it is like to live in the bordered state. Or even ask an average soldier if he wants war. A soldier has seen a war and knows what it involves. But he takes part because he has to. A famous Bollywood movie, Heroes, puts it beautifully, “hum hamara kaam kar rahe hai aur wo wahan apna” (We are doing our work and they are doing theirs).Their duty is to defend their respective motherlands and they do that. And no-one thinks about them because if they did, they wouldn’t have asked for more hatred. War is not the solution to anyone, never has it been and will never be. It is true that “we” must not sit back if the “other” retaliates but we must do that in a constructive way because the fire will not just burn them. We need to realise that there are people on both sides, there are “wounds” to be healed on both sides, sufferings, impartial truth and misunderstandings on both sides. People on both sides have their own challenges to meet. To an average Indian and Pakistani, earning their daily bread is much more important than demanding war. We have to realise… not to pacify ourselves but to realise. Can you imagine the situation where we can meet a stranger who looks very different from us, speaks a different language and has different beliefs and values easily but can’t meet our own brother? Or when we are allowed to travel thousands of kilometers without much hassle but to travel mere 50 kms, we have to give a thousand reasons, documents of all kinds and wait endlessly but without any assurance of success? Such is the relationship between India and Pakistan. 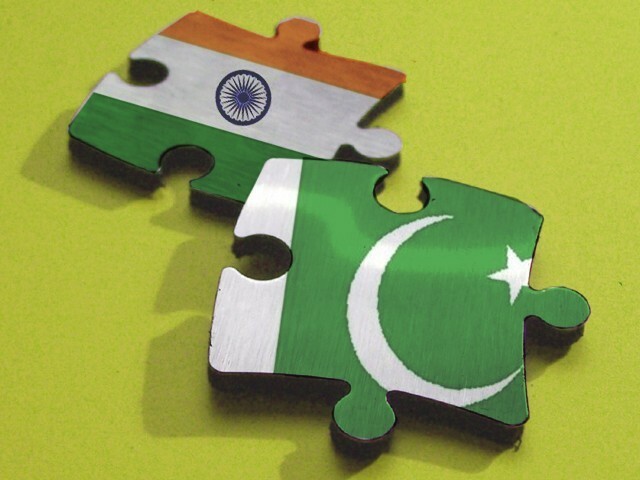 Even after 65 years of the fateful parting of ways, India and Pakistan has failed to establish a normal relationship. Even after several efforts by the civil society in both countries, the states refuse to surrender their ego and help in establishing in trust. However, people in both countries have acted much more mature and have moved on. They are ready for a strong bond of friendship and brotherhood. Many Pakistanis cross the border for medical treatments. Similarly, traders and business men have also increasingly moved beyond the borders. Education has also emerged to be a reason forcrossing over to India. Music has been one of the strongest agents for the change in indo-pak relations. But, a little problem in the states’ relations and the next thing you know, the singer has been sent back or has been barred from coming to India. There have also been reports where the singer blames the organizers in the host country for not helping in the visa, leading to major tussles. The most severely affected people are those who come to India for medical treatments and what about those who have relatives here? People, especially, in the border areas, have relatives in Pakistan and vice versa. Can we imagine their pain of not being able to see their relatives for years? I have read stories where siblings got separated during the partition. Thevisa problem is more severe for Kashmir. A Pakistani is not allowed to visit Kashmir. What about the Pakistanis who have relatives in Kashmir? Why can’t he visit them? India has also appealed to Pakistanis in the field of education. Many students apply but they are also denied visa. Reasons include frequent visits to India, involvement with an NGO in Pakistan etc. There are also other restrictions concerning the visa. The processing time is too long. A Pakistani can not only visit Kashmir but has to apply the visa for a specific city. Multiple visits are also a problem. It is not to say that security should not be considered, but we need to know who to target. Once in India, the Pakistani is, anyways, closely watched by the intelligence groups. The rule of applying for a particular city should be lifted. The person should be instead asked to report where he is going and for what, to the authorities. The authorities must monitor that. Those who have relatives or are here for education or medical treatment should also be debarred from the un-necessary hassle. Regarding the security, the reality is that the demons that conspire against India to unleash hell do not face much problem in getting the visas but the people with good intentions face all the hell in the world. The Governments have recently announced that reforms will be introduced in the visa policy and it will become friendlier. We hope that it happens as without meeting each other, how can we think of friendship? How can we trust each other if we don’t get to interact? The misunderstandings exist because we don’t know each other, we have not seen each other, and we have not visited each other’s country? If we have friends in Pakistan, can we ever think of doing any harm to that country? The misunderstandings and suspicion exists because we think we are different. But are we, who speak the same language, look just the same, hold same values and beliefs and the same desire to visit each other’s country, really different?